AKVIS ArtWork it is designed to imitate different painting techniques. 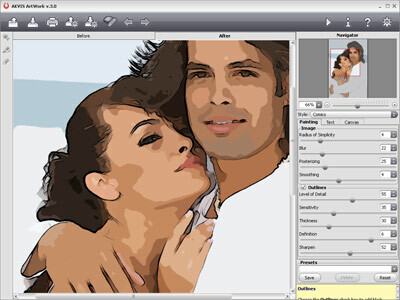 This photo to painting software helps you to create a piece of art out of any digital photo. AKVIS ArtWork is an ideal solution for your creative expression! Combining advanced technologies with an artistic approach, this AKVIS program is an impressive creative suite and a perfect virtual artist. The transformation of a picture into a painting happens before your very eyes - you can follow the birth of a work of art in real time! The program offers these painting styles: Oil, Watercolor, Gouache, Comics, Pen & Ink, Linocut, and Pastel. Create an oil portrait of your friend, a landscape painting or a still life picture. Express yourself in new genres! You can print the final painting on a color printer, frame it or put it into a ready-made photo frame, or even add some real oil strokes to make the painting real. Create a greeting card or a poster, and you have a wonderful present for friends and family. No brushes or paints are required. Just get ArtWork and unleash your creativity. Young artists and art teachers can use ArtWork to improve painting skills. Those who generally focus too much on details can first simplify their images using ArtWork, then use the result as a reference to paint their own oil painting. The software includes ready-to-use AKVIS presets which help you start working. They can be applied as is or can be modified. The program lets you save your favorite photo-to-painting settings as a preset and use them in the future. It's possible to import and export your presets. The software offers Batch Processing support that allows you to create comics from home videos! AKVIS ArtWork is available in two versions - as a standalone program and as a plugin to a photo editor. The plug-in is compatible with Adobe Photoshop, Photoshop Elements, Corel Paint Shop Pro, etc. Min 1 Gb RAM; Min display 1024x768; video card: Direct X8+ compatible. Top 4 Download periodically updates software information of AKVIS ArtWork 7.0 full version from the publisher, but some information may be slightly out-of-date. Using warez version, crack, warez passwords, patches, serial numbers, registration codes, key generator, pirate key, keymaker or keygen for AKVIS ArtWork 7.0 license key is illegal and prevent future development of AKVIS ArtWork 7.0. Download links are directly from our mirrors or publisher's website, AKVIS ArtWork 7.0 torrent files or shared files from free file sharing and free upload services, including Rapidshare, HellShare, HotFile, FileServe, MegaUpload, YouSendIt, SendSpace, DepositFiles, Letitbit, MailBigFile, DropSend, MediaMax, LeapFile, zUpload, MyOtherDrive, DivShare or MediaFire, are not allowed! Your computer will be at risk getting infected with spyware, adware, viruses, worms, trojan horses, dialers, etc while you are searching and browsing these illegal sites which distribute a so called keygen, key generator, pirate key, serial number, warez full version or crack for AKVIS ArtWork 7.0 download. These infections might corrupt your computer installation or breach your privacy. A keygen or key generator might contain a trojan horse opening a backdoor on your computer. Hackers can use this backdoor to take control of your computer, copy data from your computer or to use your computer to distribute viruses and spam to other people.